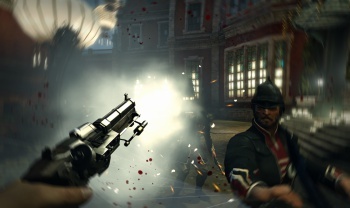 "We clearly have a new franchise," says Bethesda of Dishonored. A new IP is always a risky proposition, even for an established developer, but Bethesda believes it has created something special with its stealth action title, Dishonored. "We're very pleased and appreciate all the fans that have supported Dishonored and Arkane," said Bethesda VP and marketing head Pete Hines, adding, "We clearly have a new franchise." Sales of Bethesda's stealth action game have exceeded the developer's expectations by a wide margin - though Hines was careful not to mention actual numbers - and is still doing very good business on Steam. In fact, according to Hines, Dishonored was the number one Steam seller over the holiday weekend. Overseas sales have also been extremely encouraging, all of which leads Bethesda to the inescapable conclusion that it has something worth following up on. Dishonored: Dunwall City Trials is due in December, and there's more DLC to come after that. But for those of you who really want a sequel to the original, whether featuring Corvo or some other Outsider-blessed protagonist, consider this your reward: Bethesda thinks more Dishonored is a great idea.